Good Morning! 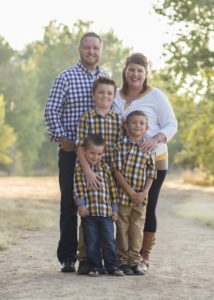 Welcome to our Kawasaki Kids Foundation blog, where I will be writing about Kawasaki Disease, being a father, husband, and the Executive Director of the Kawasaki Kids Foundation. My name is Shawn Logan, I’m married with three boys, ages 12, 9, and 5. My beautiful wife is in her last few months of the master’s program at Colorado State University. Big brother Dallin is 12 and loves football, basketball, golf, and is a great artist. Jake is 5 years old and is the size of a 8 year old. You will find him doing everything his brothers are in to at the time, and rarely will catch him playing with toys. Our middle child is for sure the wild one of the family, keeping us on our toes constantly. Cooper is 9 and is all boy, desperately wanting to play every sport he can and even ride motocross. However, Cooper was diagnosed with Kawasaki Disease (KD) when he was 3 years old and can not do any contact sports. He became very ill, so doctors rushed him into emergency appendectomy to remove his appendix. Unfortunately, the appendix was not the issue and Cooper was hospitalized for the next 12.5 days. Cooper was then diagnosed with KD and sadly missed the vital 10-day window to avoid heart dilation. I will always remember the day we found out at the hospital that he had KD and the thought I had of what the heck is that. I had never heard of this disease, so it was a complete shock. All I could think about was, I didn’t do enough for him before we got to Children’s Hospital. Before we had him transferred to Children’s Hospital Colorado for amazing treatment, he sat lifeless in a hospital in Northern Colorado. I beat myself up daily for not fighting harder for my child, which ultimately fueled a passion inside of me to start this foundation. Fast forward one and a half years later, we were on vacation as a family heading to Las Vegas. As we started in from Arizona, just coming up over the Hoover Dam, we noticed something not right with Cooper. He hadn’t been feeling good the last leg of the trip, which caused him to stay in the car when we would get out to sight see. But, as we came into the Las Vegas valley, I remember seeing parts of his body start swelling up. It was scary for sure, and our doctor told us to rush him to Children’s Hospital Las Vegas for treatment. Cooper was bleeding internally, which subsequently turned into full kidney failure. His road has been filled with small and large trials, but he continually tries and finds the positive in his life. I am not a writer one bit, but I am however a passionate dad who wants to make a huge difference in the KD community. So, there is the “why” for why I am doing this blog. I think about each kid that we run across as an extension of our family! Kawasaki Kids Foundation is a non-profit dedicated to growing awareness, educating those we come in contact with and that even includes the medical community, supporting our Kawasaki Kids and their families, and funding research for a cure or even a test to diagnose easier. We have saved 23 kids as of today due to early diagnosis, which comes from education and awareness from our social media, KD symptom posters, videos, and events we do. That is amazing to me! How does donating blood or plasma help with an IVIG treatment? How people can get involved in their community. What to expect for a child that is caught in time with no heart dilation. Meet Up with other KD families. Heart healthy eating when it comes to our children and family. How to keep peace in the family when there seems to me so much turmoil and stress from sickness. Are you an open or closed book when it comes to telling your child what exactly is wrong with them? Ten 5K’s in 2019 is impressive, so how do we join the movement? I love that you have started this blog. My daughter was diagnosed with KD this past December. The pediatrician we had to see mentioned it as a possibility at the first appointment, but then at a later appointment, retracted that and said he thought it was a virus. After three days of worsening symptoms, we pushed for hospitalization and where she was then diagnosed and treated for KD. I had no idea what this disease even was until the pediatrician mentioned it. Our cardiologist is from Denver and said she treated it weekly there, but only sees about 5 cases a year where we live. It is not well known here and I would love for more parents to be aware! Really nice. I enjoyed reading it. Very informative. Thanks. You are too kind! Thank you so much for the comment and the support. Thank you for sharing. I look forward to reading your blog. Be proud, stay strong! My Grandson was 5 months old when he was diagnosed with KD, like yourself we had never heard of it. We were lucky because of a trainee doctor who after other doctors misdiagnosed from just an infection to hand, foot and mouth. Luckily he made a full recovery. He is now nearly 4 years old but just before Christmas started showing symptoms again he had everything from the rash, swollen neck and rash, so my daughter took him straight to hospital and again they treated him for KD, he is back to his normal happy self again but still worry, we were told that it was rare that it would reoccur but it did. It’s great what you are doing and been in touch with the UK society. Yes, a second occurrence of KD is so rare, but glad he was caught in time on both instances. Thank you Wendy for leaving a comment and connecting with us. My daughter was diagnosed in August, 2000 when she was 11 months old (and she just left for college last August!). Back when she was diagnosed, the internet was brand new and there was little to no information for me to find online. I started a yahoo groups page back then describing our story and for years, parents from around the globe would contact me begging for more info because there was just none available. I’m so glad there are soooo many more resources out there nowadays, and I’m anxious to read more about your upcoming topics. Great article! My son was diagnosed with atypical KD couple years ago. He was 17 when diagnosed & several health care professionals misdiagnosed him as having strep, norovirus. It took them one & a half months to finally get diagnosis. No cardiac problems after thanks goodness but he will need to be tested yearly…Thanks for getting the word out on KD-you have a beautiful family! He for sure was atypical KD being that he was 17 years old. Terrible that it took that long to get diagnosed, but so glad he had no heart issues. Thanks for reading and hope to see you out at one of our 5k’s this year. I’m super excited about this blog! Great way to talk with others who have been there and share awareness plus keep up to date on everything KD. I am sort of an expert on KD in my own way. I am currently 30 however when I was 11 months old I was diagnosed with KD and treated then I was diagnosed and treated again almost 1 year later. Top it all off my youngest son was diagnosed with KD 2 years ago when he had just turned 6 years old. He received treatment quickly thanks to my knowledge and my voice to the doctors that I knew what he had. WOW! 2x yourself and a child with KD also, that does qualify you as a expert. So glad to hear you and your son are doing well. Thank you for the kind words on my blog and look forward to growing our community, awareness, and footprint on the world. Hope you see you and your family at one of our 5k’s this year. Stay strong! Wow, this was a great blog and shows the frustrations and concerns parents who go through this disease with their children experience. Thank you so much for sharing! My 6 year old daughter was just diagnoised Feb 5,2019. We had initial onset of symptoms on January 24. We are unfortunately outside of the window for treatment. She is experience extreme fatigue and is going to half days at school until we can recovery. I had only heard of the disease and finding information is hard. I emailed you to see if I can answer any of your questions you might have. Stay strong!